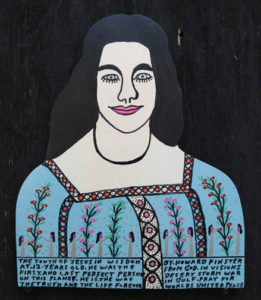 Howard Finster was born in Valley Head, Alabama in 1916 and is one of America’s most renowned folk artists. Finster was a preacher for 45 years until one day in 1976, he had a vision and afterward began painting “sacred art.” He usually painted on wooden cut out figures or rectangles, subjects that ranged from Leonardo da Vinci paintings, Elvis, model-T Fords and Coca Cola shrines, to self portraits–all with his written messages, painted in bright colors. At some point after his first few works, on each finished piece he painted in a wacky fashion, the painting’s number and the time that he completed it. He was brought up on a family farm. Howard’s family was Baptist and his childhood included regular churchgoing and attendance at revival meetings. At the age of 16, he received his lifelong calling to become a preacher and then began to follow that path. 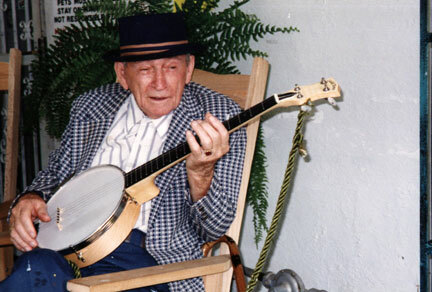 As a child of the Depression, Howard was resourceful in his early evangelical efforts. He made a wide variety of original woodwork items such as picture frames, clock cases and doll furniture that he sold in his town square accompanied by fervent preaching. He was a clever marketer from the beginning. His preaching was supplemented with a variety of odd jobs. And so it was that fixing and painting bicycles would provide the occasion for his own conversion, at the age of 60, to becoming an artist. He got some paint on his finger and a face appeared in that smudge of paint. 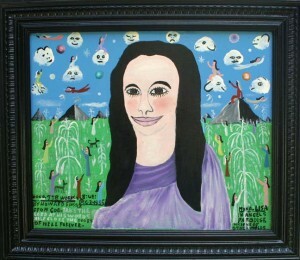 The face came with a spirit voice that commanded him to “create sacred art”. From that time in 1976, Howard devoted his efforts to creating “sermons in paint.” His interpretation of his original vision as a directive to make five thousand pieces of art led to his unique system of numbering each piece. As Howard’s artistic and religious zeal found expression, he did not stop at five thousand, and painted until his death in 2001. 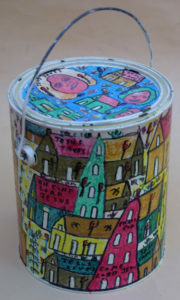 Finster’s creative work was not limited to paintings. He also set out to create a church and religious environment that he called Paradise Garden. Finster filled-in a two-and-a-half-acre swamp in northeast Georgia by himself. He then spent years making poetry out of rubbish, weaving his vision amid a jungle of berries and fruit. “One night I asked what I had preached on that morning and everybody forgot my message,” he said. “And that’s why I decided to build my garden, so they can’t forget.” Constructed on a property of several acres, it included a chapel, wildly inventive sculptures and constructions, all designed to attract and hold the attention of his visitors. Paradise Garden became a gathering place for folk art enthusiasts from around the world. A portion of Finster’s Paradise Garden is now preserved and on view at the High Museum in Atlanta. 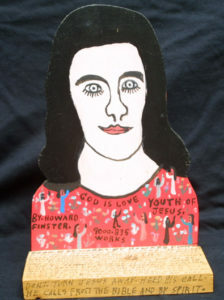 Howard Finster was the perfect example of a visionary artist. His art was inspired by visionary experiences with God. He saw himself as a medium through which the word of God could be brought to the world. Howard often painted and spoke about his experiences of traveling to other worlds. These experiences were as real to him as any in his everyday life. Howard’s work was included in the 1984 Venice Biennale. When asked if he wanted to go to Venice for the exhibit, he is quoted as saying “Brother, I’ve been to Venus several times and I don’t need to go back.” Finster appeared on the Tonight Show, illustrated album covers for R.E.M. and Talking Heads, and was featured on the cover of Time Magazine. 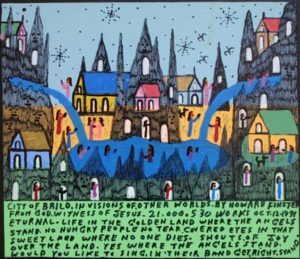 His art is included in The Smithsonian, American Visionary Museum and the Museum of American Folk Art among numerous important collections worldwide.